Now that Thanksgiving is over, it’s time to get your healthy-self back on track! 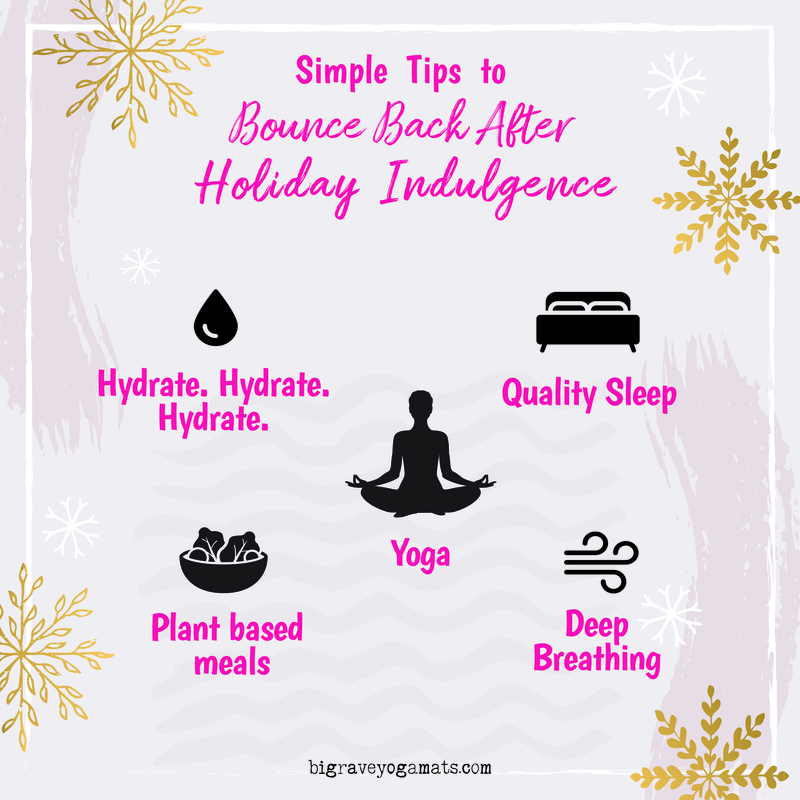 Here are 5 simple tips for bouncing back after a holiday binge. Drinking enough water is important to help your liver and kidneys filter out toxins. Drinking 2.7 liters (12 cups) of fluids for women and 3.7 liters (16 cups) of fluids for men is a normal amount to take in to stay hydrated. These recommendations cover fluids from water, other beverages, and food. Sleep is your body’s natural repair, regrowth, and recharge agent. One of the main benefits of a good nights sleep is hormone balance. But with a jam-packed schedule during the holidays, it can be easy to let normal sleep habits fall by the wayside. So, get to bed at the same time everyday and make sure that you’re getting at least 7–8 hours of sleep. Focus on nourishing, healthy meals such as fruits, veggies, and plant-based proteins. Aside from boosting your metabolism, these foods will also help curb your appetite and prevent you from overeating. Deep rhythmic breathing helps to relax the body and massages your lymphatic system which helps flush out toxins. It’s an easy process that will allow your system to work more efficiently. Yoga Lover. Instagram Influencer. My puppy is a well behaved human. California Grateful. Treasure of Big Raven Yoga.